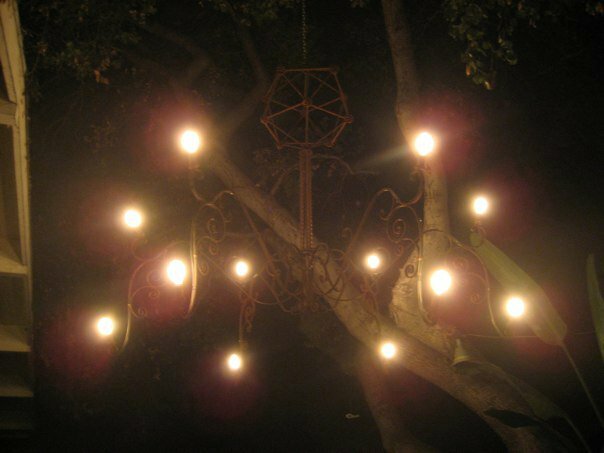 This summer I decided to work on a project that I’ve had in the back of my mind for a few years: a backyard chandelier. The backyard of the BWMA had a perfect tree overhanging it, but my petty and negligent neighbor decided to cut down all of his trees. The legality of this tree slaughter was questionable, but the stupidity was not. But, now that I’ve moved to Orlando House in San Marino, we’ve got the perfect backyard for a chandelier. Large oak trees overhang our wooden deck, but there is not adequate light at night. A big rusting chandelier is just the trick! I wanted to create something that would weather the outdoors for a few years while rusting beautifully. This chandelier won’t last forever, but sometimes art is temporary. It will certainly last a decade, and that’s longer than I’ll be living in this house for sure. I also wanted to bring something awesome to Burning Man this year, as I wasn’t going to be working on the art car like usual. Having Burning Man be a deadline for the project was a great benefit. I have a habit of putting things indefinitely if I don’t create a deadline for myself. I bought all of the steel at Industrial Metal Supply. It included twisted steel cables, hammered square tubes, and ironwork for decorative fences. I laid it all out and created a 6′ diameter bacteriophage, in style of our Burning Man camp: The Phage. I cut the pieces, and welded them together. This wasn’t my first steel phage sculpture, so I knew what I was getting into. There were two new obstacles that I had to tackle. I had to make the chandelier so it could be dismantled for storage and transportation, and I also had to hide the wiring as best I could. I couldn’t find too much in the way of decorative tubing, so many of the wires were going to be visible. But, I think I did a fairly good job of keeping that to a minimum. Both of these problems weren’t insurmountable. I created the legs so that they could be individually bolted onto the torso of the phage. The electrical connections were wire-nuts, which could be stuffed inside of holes in the torso. 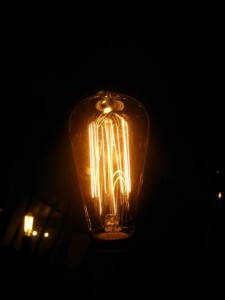 I also found a great set of 60W antique bulbs at 1000bulbs.com. There are 12 bulbs, so that means a power draw of 720W. I’m not thrilled about that, but it really does light up the entire backyard very well. They weren’t cheap, but the steel wasn’t either. Sometimes art costs money. The bulbs themselves are amazing to look at up close. I sure hope they stand up to the temperature swings of outdoor use. A legitimate concern is falling acorns and branches which might break my bulbs. I bought a few extra just in case. The chandelier is heavy and strong, and its destined for a decade of beautifying my backyard. I can’t wait to entertain friends at the next party.